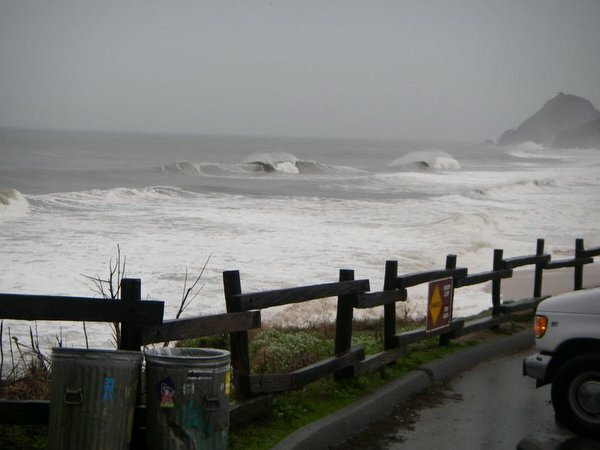 This morning was a truly local surf scene we all happened to show up at Montara at the about the same time. It was foggy, soggy and junky. But quite often, we'd be forced to pick a spot and this would be "it." We should be all weary of spots where you can check from a cliff-top, because it is always the case that it looks like an easy paddle out from the top. Well, by now, I am a bit wiser surfer to be fooled by this, but then we paddle out the reality hits the board. I even thought that there was a channel, but that was far from the thought. I jumped in where I thought was a "huge rip like a river flowing out into the ocean" only to find out paddling, ducking, paddling and ducking. Some more experienced surfers were already out, but I could not figure out how, almost. At this point of time, I have gained a bit more confidence and more muscle fibers on my body, but it is still a heck of a lot of work to get out there. Then sets start cranking, then that's basically is the start and the end of the story. When they start, it would be waves and waves and waves of waves! I am ducking through so many waves and then the lineup seems to be miles away! I look back and I have not moved an inch. Then the waves around me start to form huge ripples? now I am trapped. Cannot go forward nor towards the beach. 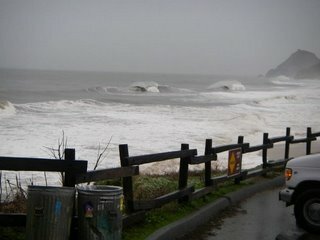 The only hope is for this set to stop for a while so I can either paddle back and walk up the beach, or paddle out. Since getting further out was not an option for me, I paddled back in. That took me some effort too. What a relief though when I stand and I feel the sand beyond the layer of rubber wrapping my feet! I walk down the beach to find another channel. This time, I found a real channel, and without much effort I am escorted to the outside. Part of me is really freaked out about the fact that I am being carried out towards Hawaii, and at the same time I am so happy that I am so "cool" that I know how to handle the situation. Well, some of my surf buddies are still out there, that gave me an additional piece of mind. Then there is a wave front coming at me. I push my board down in the water. The board starts to shoot up. I catch the board grabbing the rails and leap forward onto the board. I start to paddle hard, looking far ahead, but also my paddling arms deep in the water, as if I am trying to find something I lost in the water, as I start to feel the tail of the board start to lift off. "There we go, there we go, there we goooo?" the board catches the wave, and I am in a shoulder. The wave in front of me start to form a nice slanted slope. The board continues to gain more speed. I say to myself, "keep on paddling, I am not there yet." I increase the paddling power on my right arm. It is a left. The board is now starting to glide. With one big push, I tuck my legs under my board as the wave kicks my upper body up. I am on! I am on the wave! Now I am up standing on the board, but I find myself in the middle of ripple field. As I think about this, there is another bump forms on the right. I pressed my back knee to set up a turn to cut back to the right, and the board responded just in at the right time to shoot myself back to the top of the wave I have just caught. But it was starting to flat out. I pumped hard to gain the speed back as the second ripple stared form right under. I am back gaining some speed. I climbied back up the second ripple, as the wave started to lose the power. Again, I pumped, that took us to the bottom of the wave. I made another turn. Now I got the speed, and the wave was mine. I kept riding on a few more ripples connecting them with some good cutback actions. When I finally kicked out of the last ripple, I saw a couple of people at the beach pointing at me. That was really a gratifying moment, and with that I paddled back out. Well there was no more repeat of this. I just had one wave on this session, but that was enough and worth the trouble. I was glad someone did witness this magnificent ride.